1. It's always sunny: Sri Lanka is a beautiful island in the Indian Ocean perfect for tropical escapes all year round. 2. Your budget suits anyway: The island has a vibrant tourism industry so you can find plenty of accommodation options for your budget. 4. Easy to get around: Due to the small size of the island, you can reach just about anywhere in the country in a matter of hours. Almost all regions are accessible by public transport, but this should not be a concern as you would be provided a driver and a suitable vehicle. 5. A variety of landscapes: Sri Lanka may be tiny, but the island has a number of diverse landscapes to enjoy. The coastal regions of Sri Lanka are famous for palm-fringed golden beaches. The most famous beaches, like Bentota, Unawatuna and Tangalle are in the southwestern coastal belt. Southwestern beaches are developed well enough with many hotels, restaurants and other facilities. If you prefer a more low-key vibe, you can visit the northeastern beaches of Sri Lanka. Due to a protracted Civil War that ended in 2009, this part of the island was closed off for decades. Therefore, most beaches you find in the north and the east are refreshingly underdeveloped and less crowded. 6. Mountains & tea estates: There’s a mountainous region in the middle of Sri Lanka generally referred to as the Hill Country. This area is cooler than other parts of the country, and is very popular thanks to beautiful views of panoramic mountain ranges and tea plantations. The Hill Country of Sri Lanka is the best for adventure activities like trekking. Also, some of the most lauded cultural attractions of Sri Lanka, like the Temple of the Tooth Relic, are located in this region. 7. Amazing UNESCO heritage sites: The main cultural attractions of Sri Lanka are located in the north-central region, a dry area that was once the cradle of the island’s ancient hydraulic civilization. Here you will find the Cultural Triangle that connects the ancient kingdoms of Dambulla, Polonnaruwa and Anuradhapura. You can tour UNESCO heritage sites like Sigiriya, explore ancient ruins and visit temples in the Cultural Triangle. 8. Wildlife encounters awaiting: Sri Lanka also has a number of national parks that are particularly famous for wild elephant watching. You can also go whale or dolphin watching in Sri Lanka. 9. A mouthwatering cuisine: You can enjoy observing the vibrant local life and sample delicious local cuisine that is famous for their spices. 10. Well-rounded: Sri Lanka is a well-rounded destination perfect for travelers who seek beach, culture, wildlife or adventure holidays. 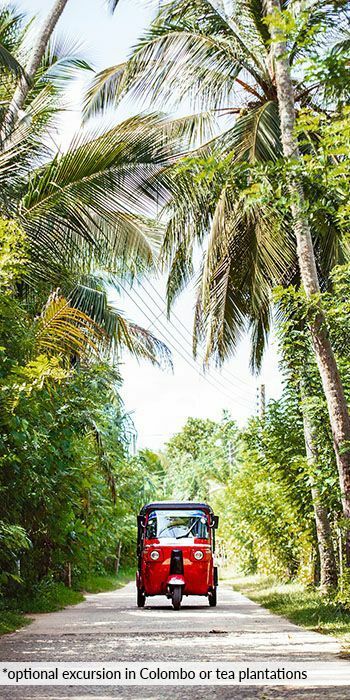 FREE TUK-TUK SAFARI* for any instant travel quote request.